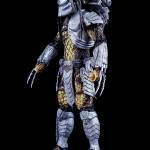 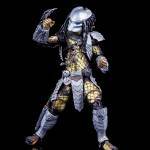 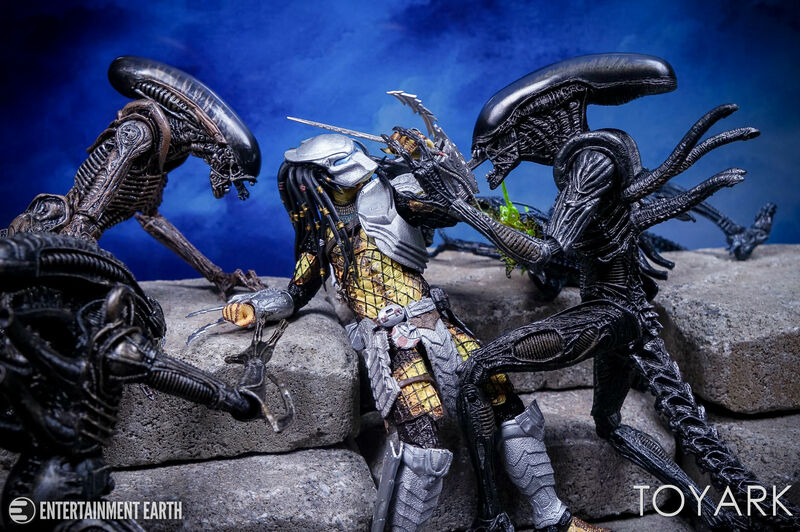 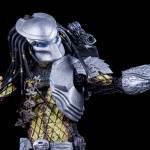 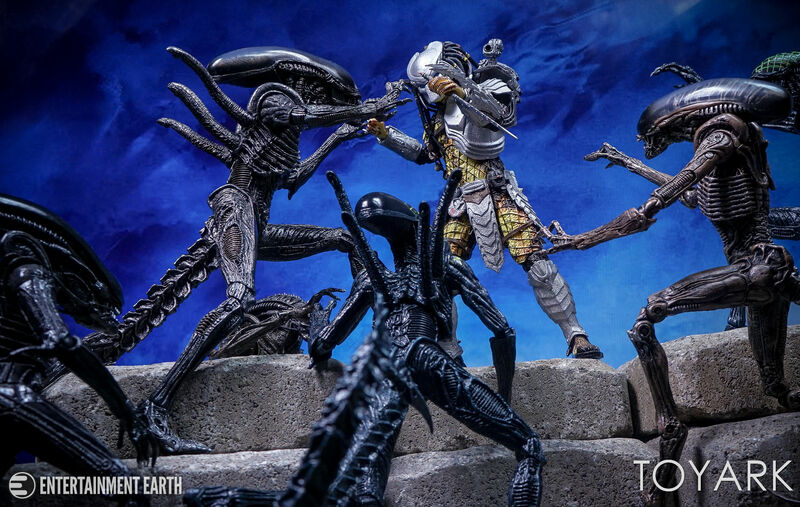 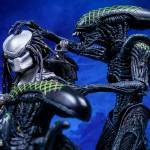 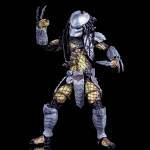 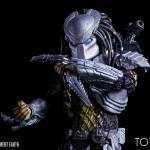 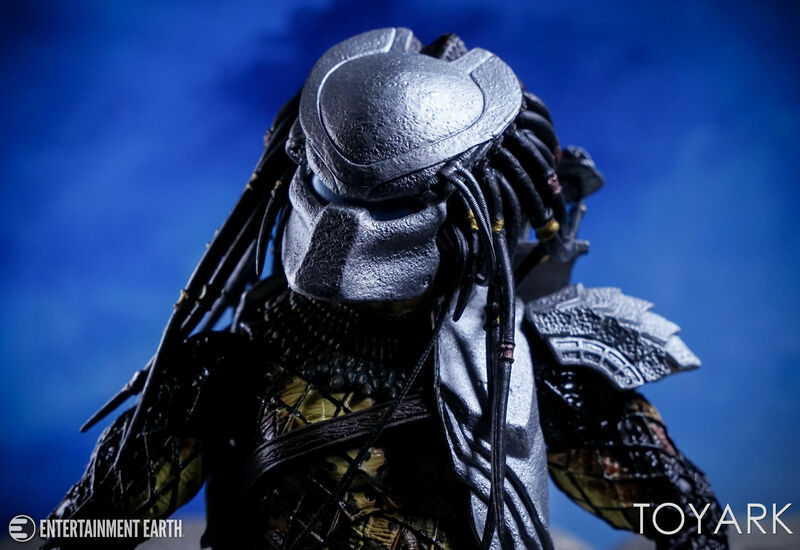 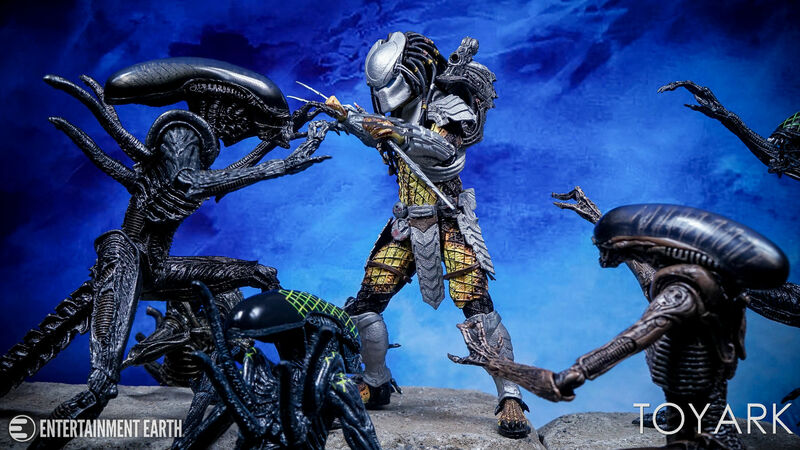 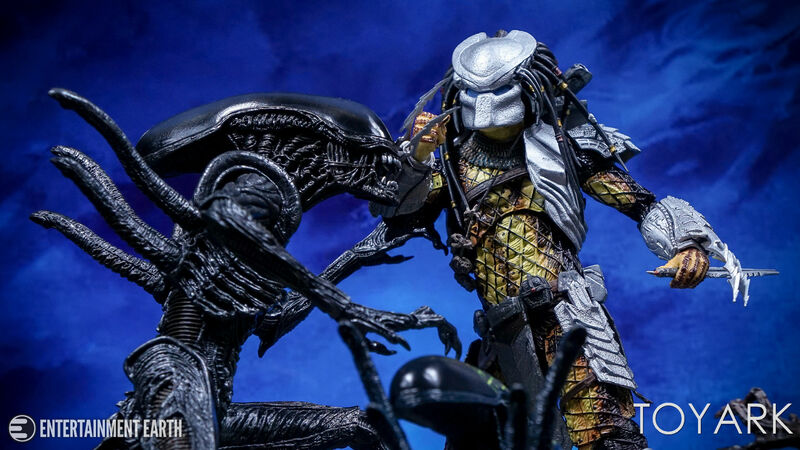 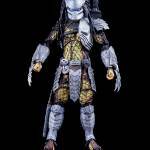 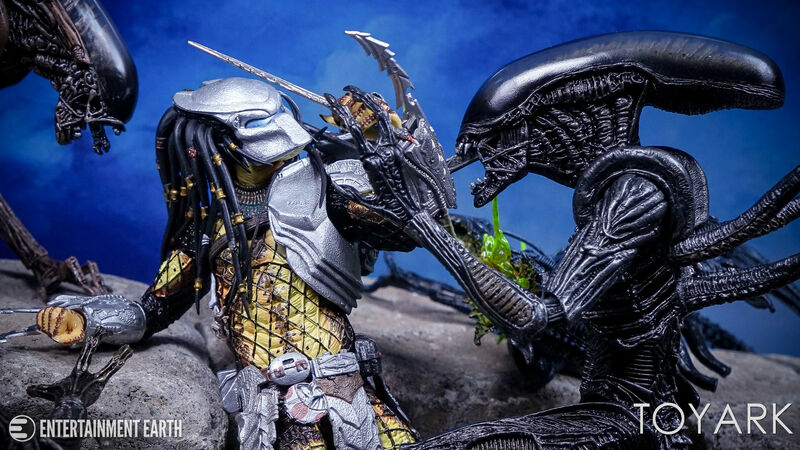 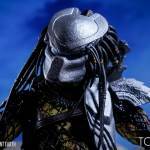 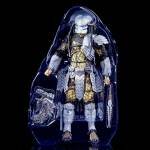 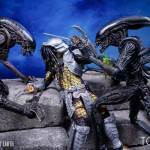 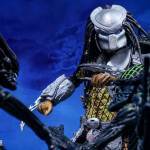 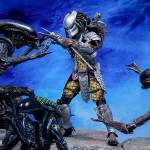 In Predator Series 17, NECA gives fans three new figures based on the Alien vs Predator franchise. 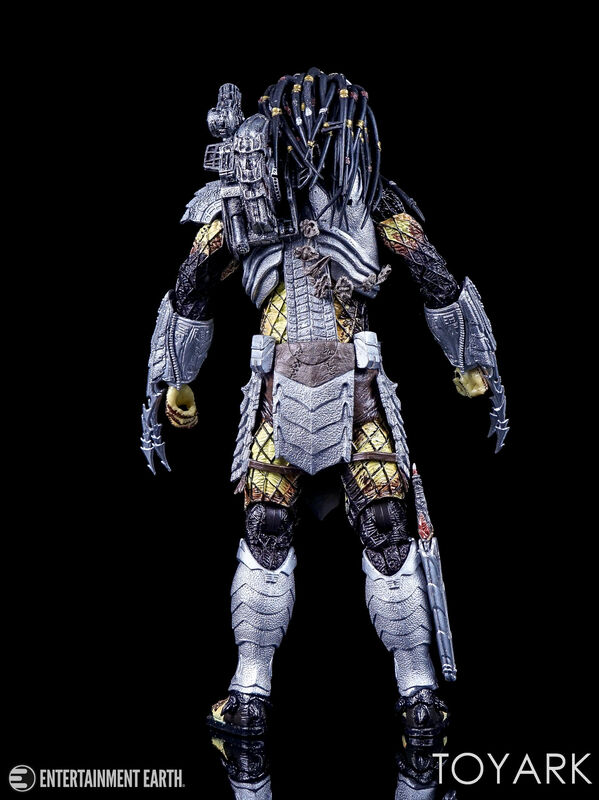 Earlier this week, we took a look at the Alien vs Predator video Game Serpent Hunter Predator. 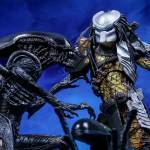 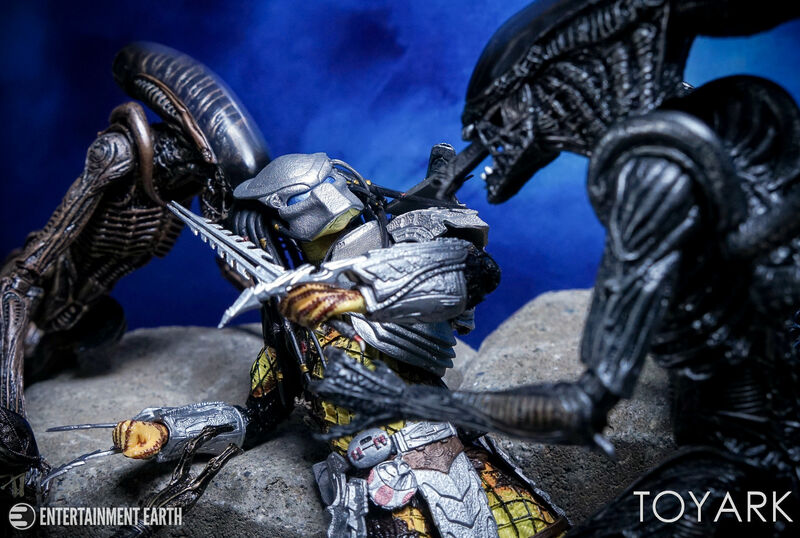 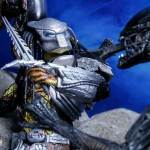 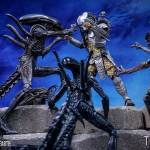 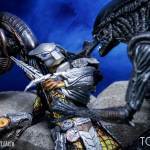 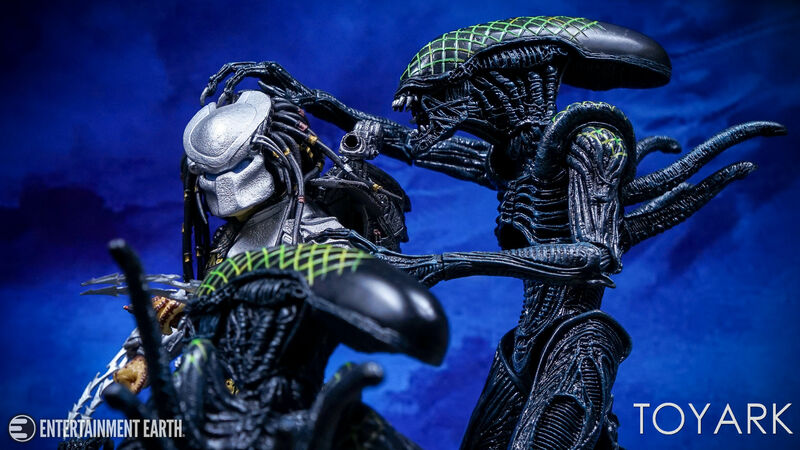 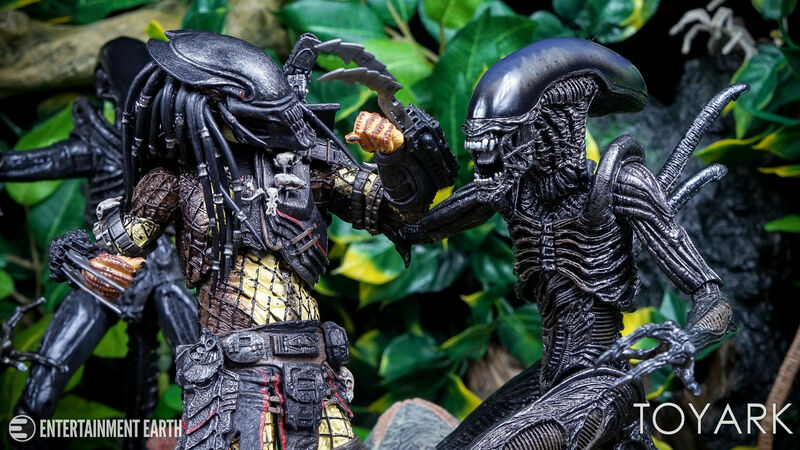 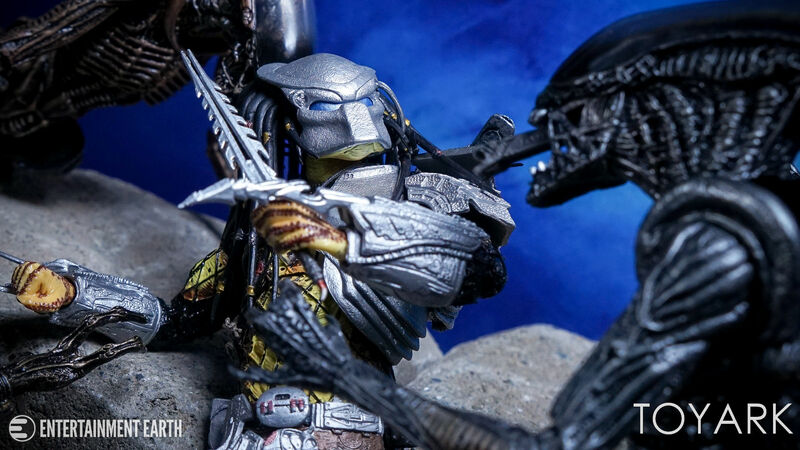 Today we have a detailed look at the Alien vs Predator – Youngblood Predator. 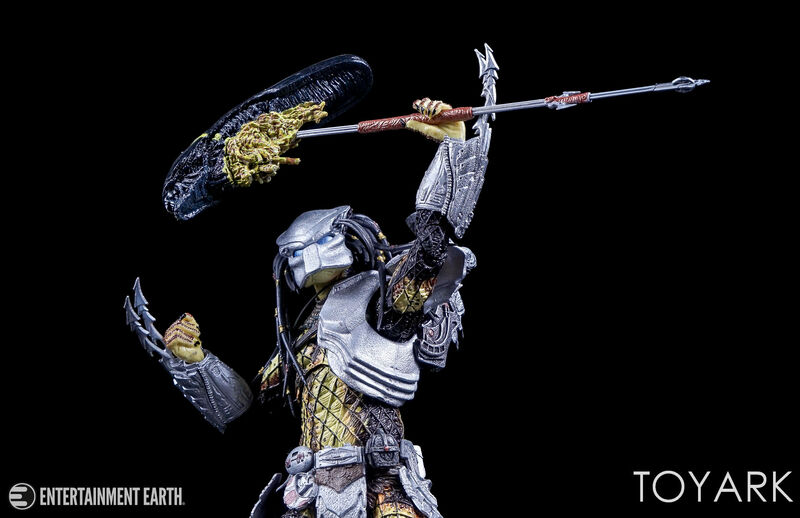 This Yautja is the first to successfully slay the Alien Xenomorph and becomes the trainer for those entering the Xenomorph battle trials. 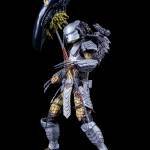 The massive figure includes a sword, a removable plasmacaster shoulder cannon, removable gauntlet blades and a spear complete with a Xenomorph head impaled on it. 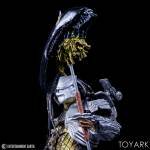 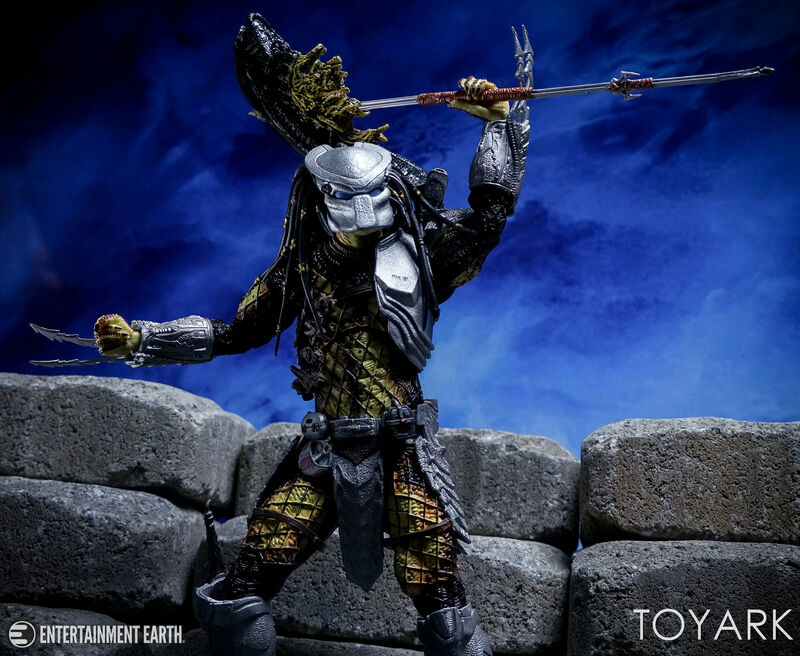 Toyark sponsor Entertainment Earth sent along the figure. 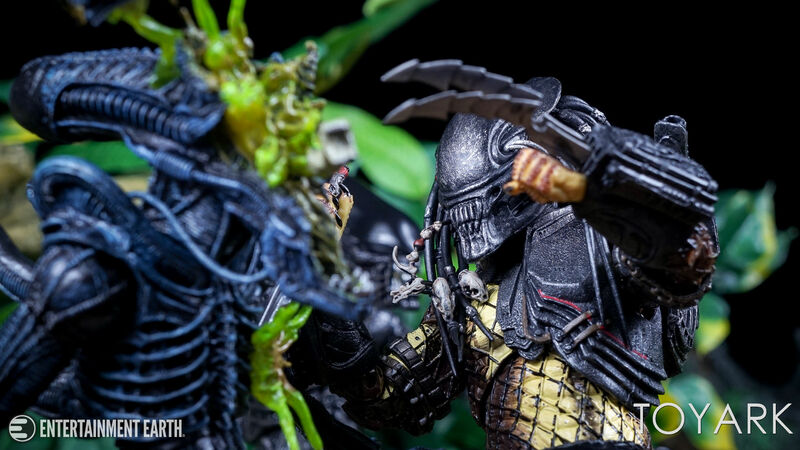 Read on to check out our review and all of the photos. 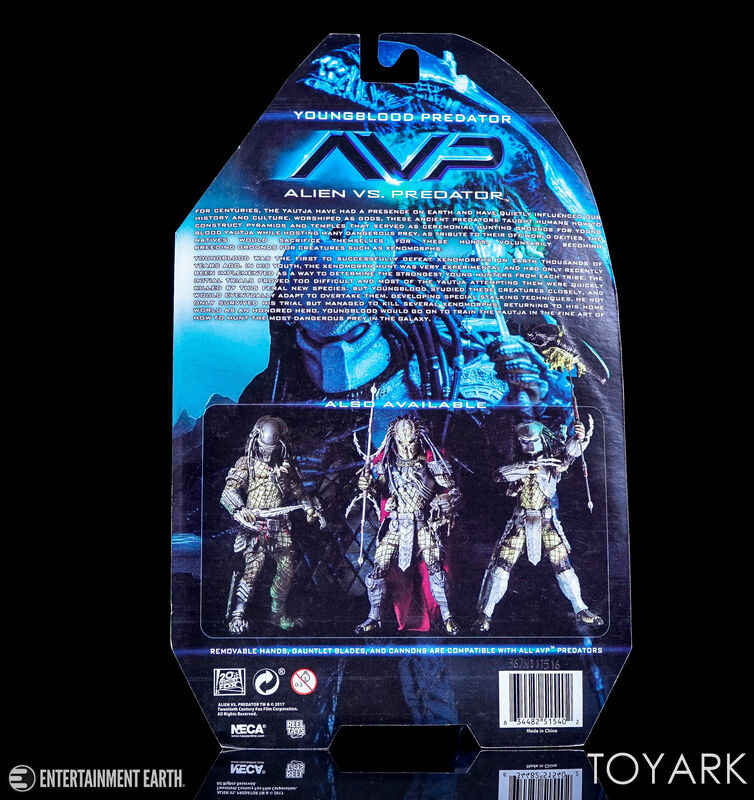 The Youngblood Predator comes packaged in an Alien vs Predator cardback that fits in with the previously released AvP figures. 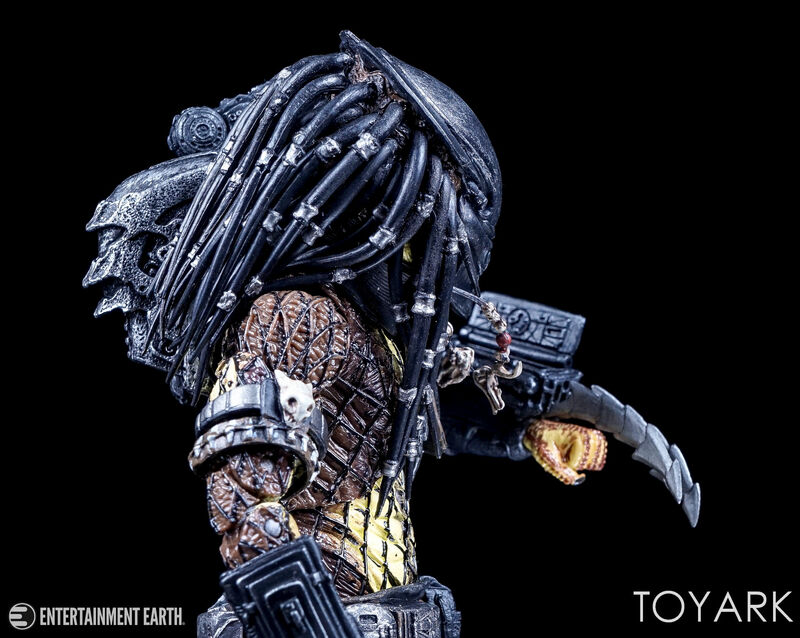 The back includes the new bio for Youngblood and a photo check list for Predator Series 17. 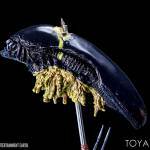 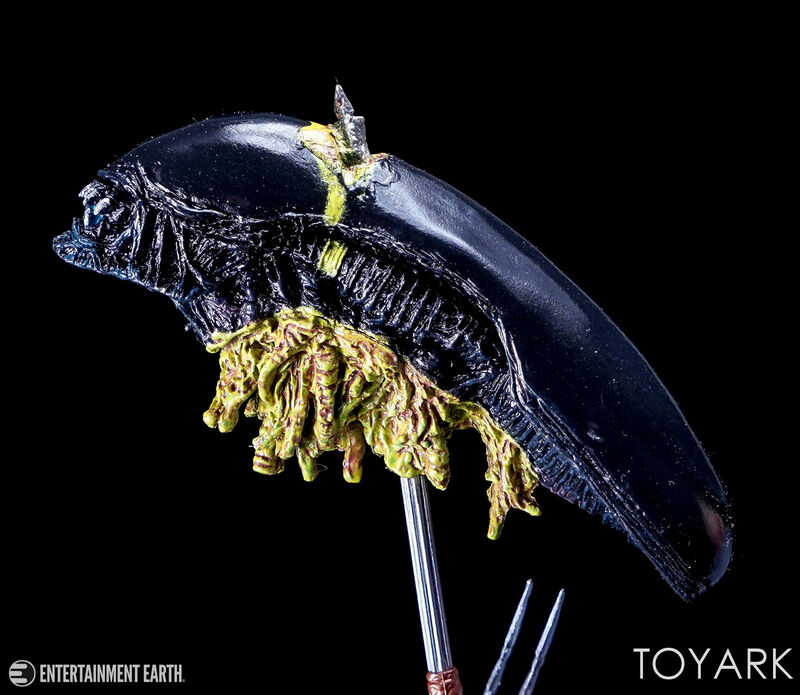 The figure sits in a plastic tray and uses a single twist tie. 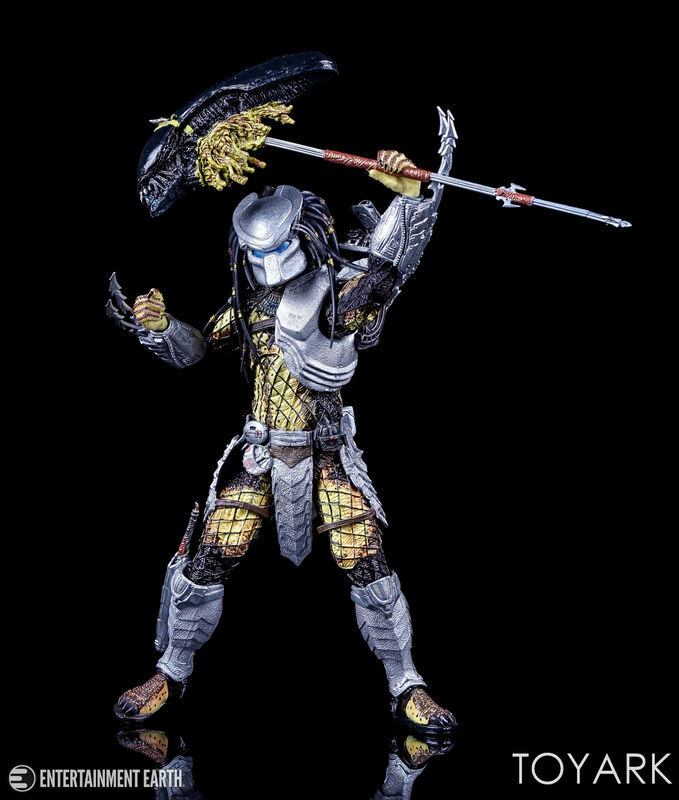 The figure comes with a sword, a removable plasmacaster shoulder cannon, removable gauntlet blades and a spear with Alien head on it. 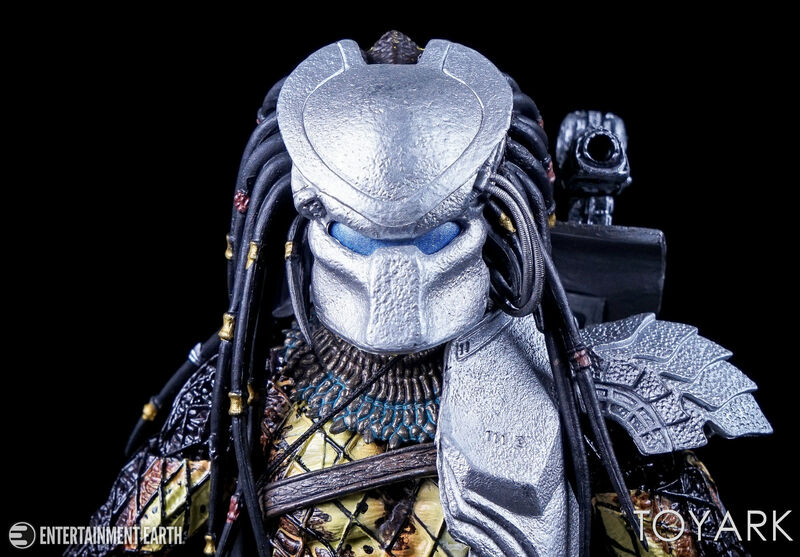 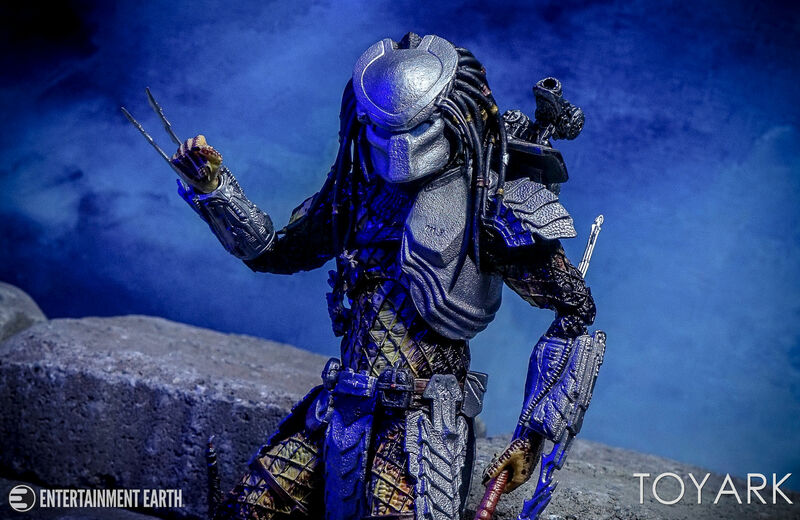 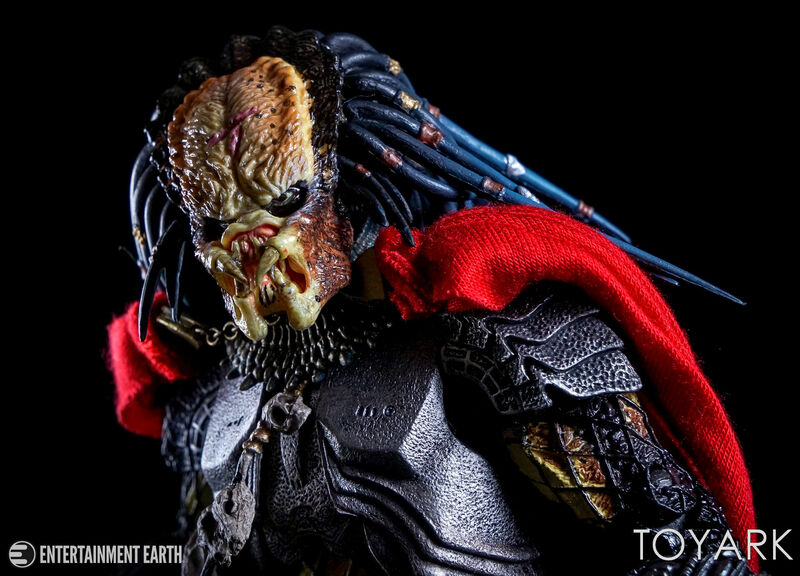 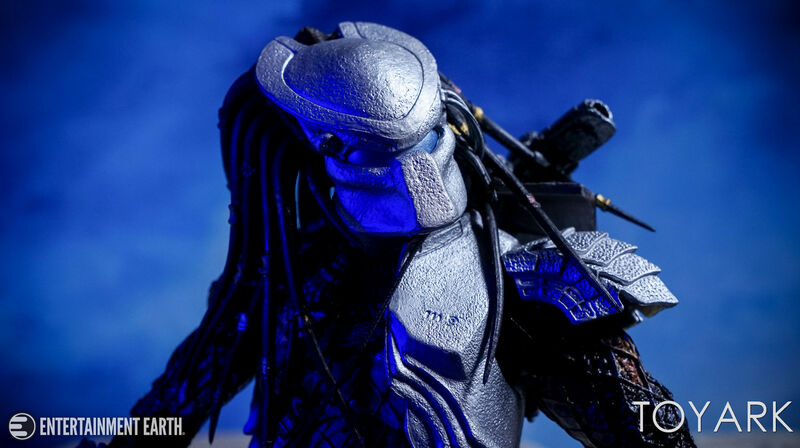 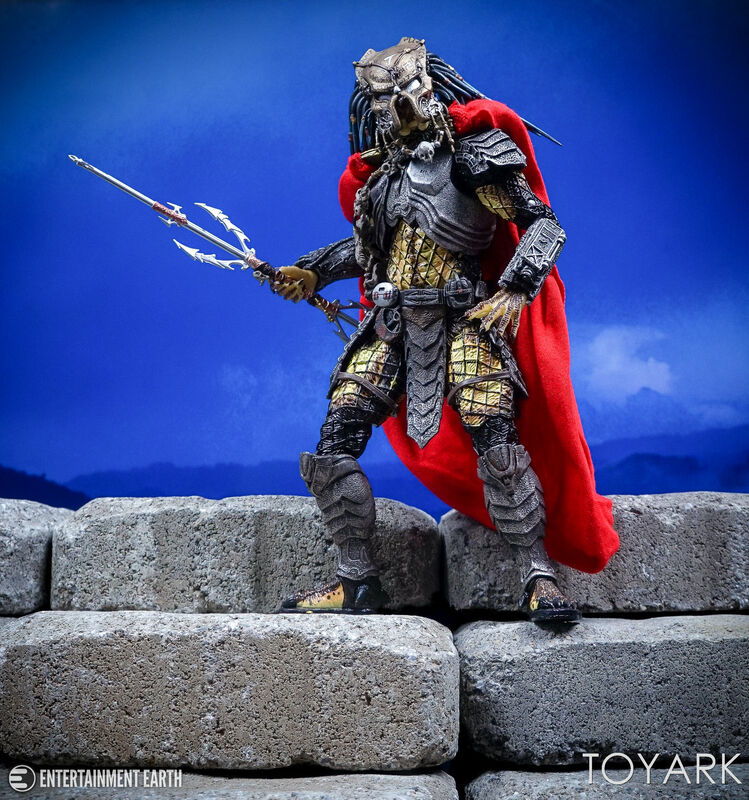 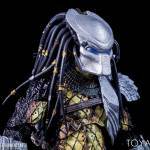 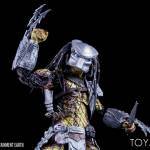 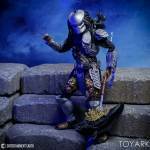 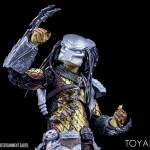 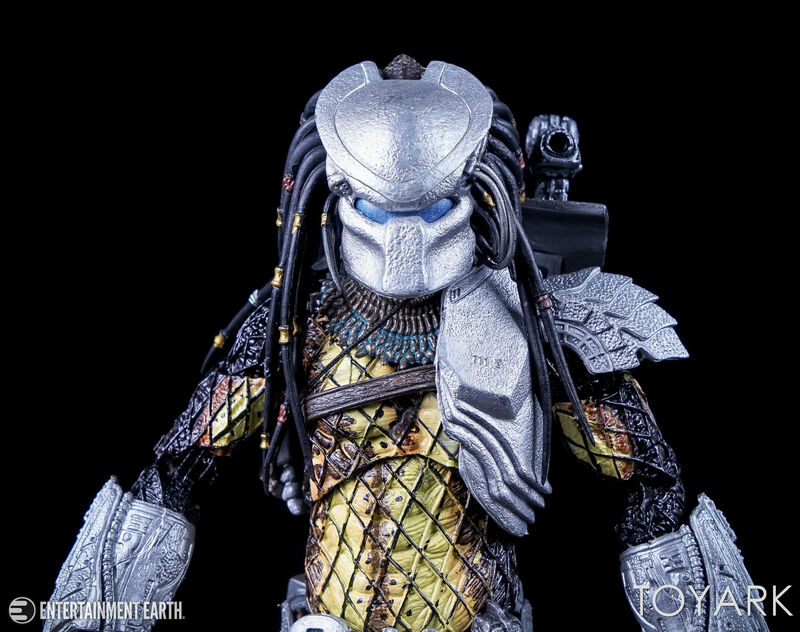 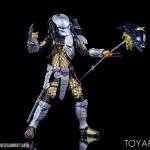 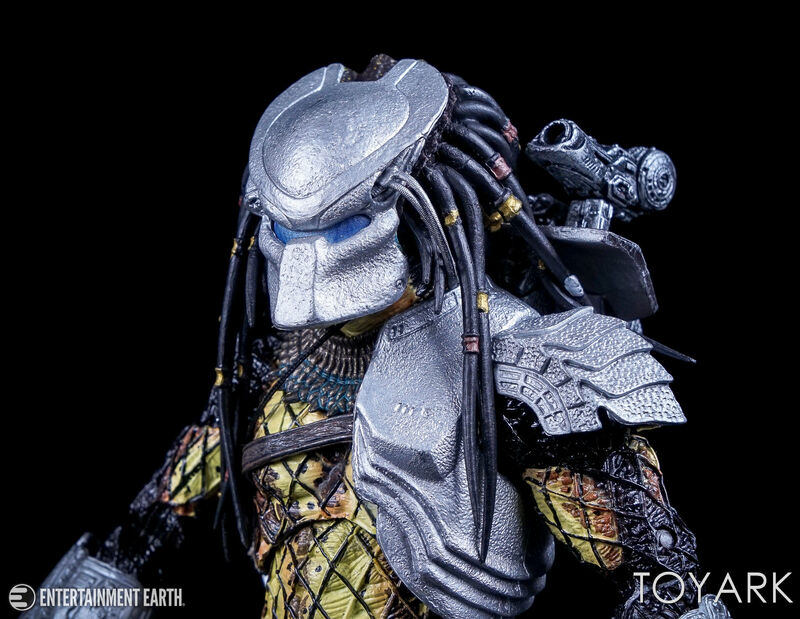 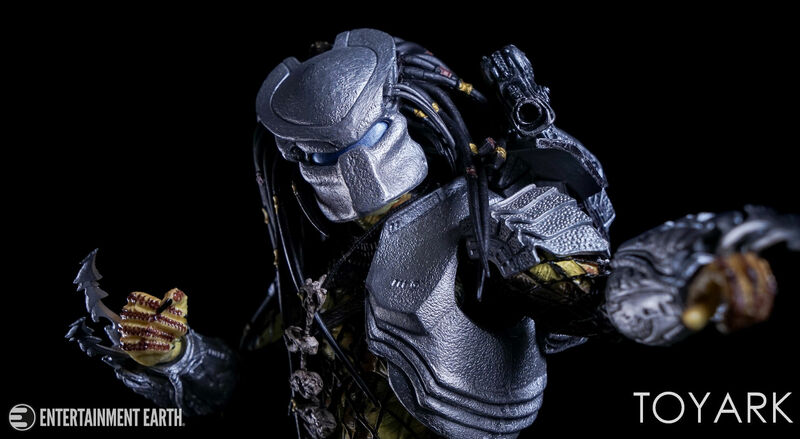 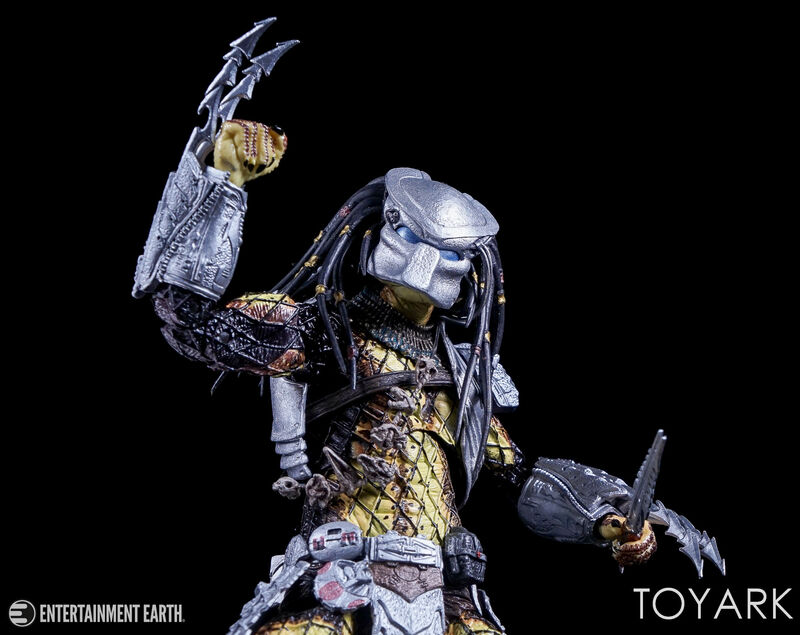 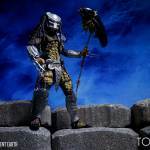 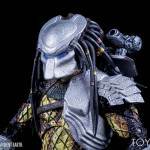 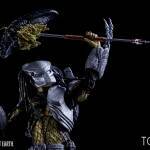 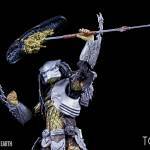 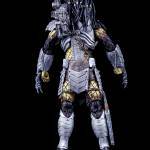 A great sculpt and paint deco highlight the Youngblood Predator. 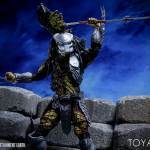 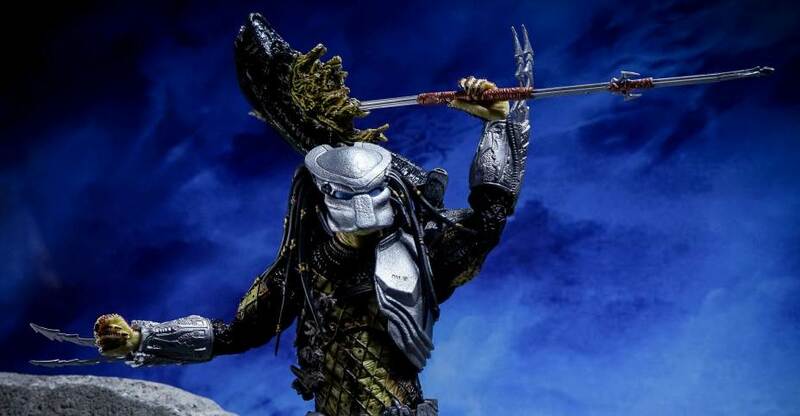 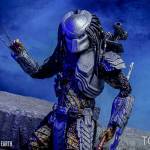 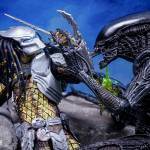 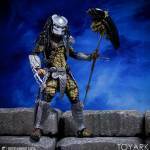 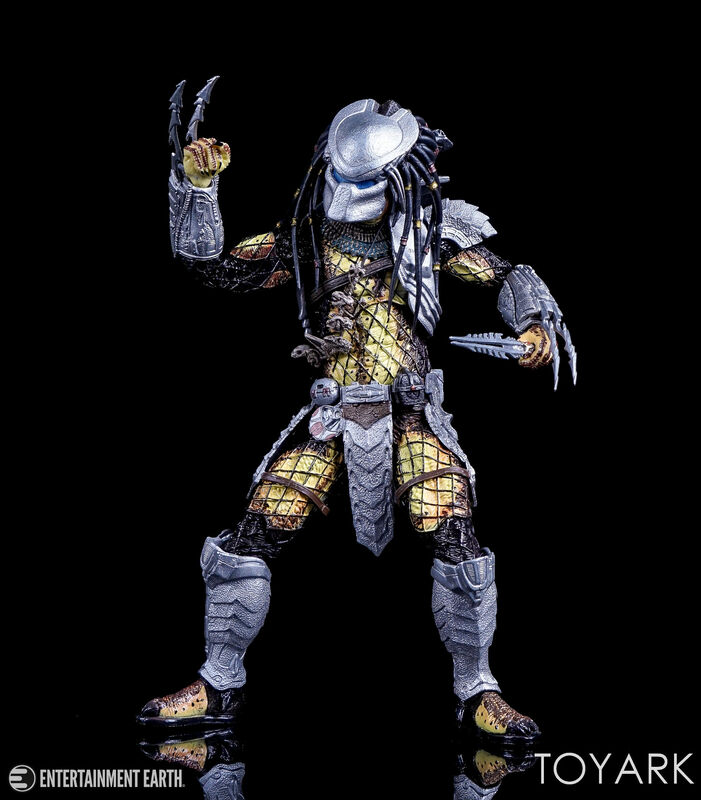 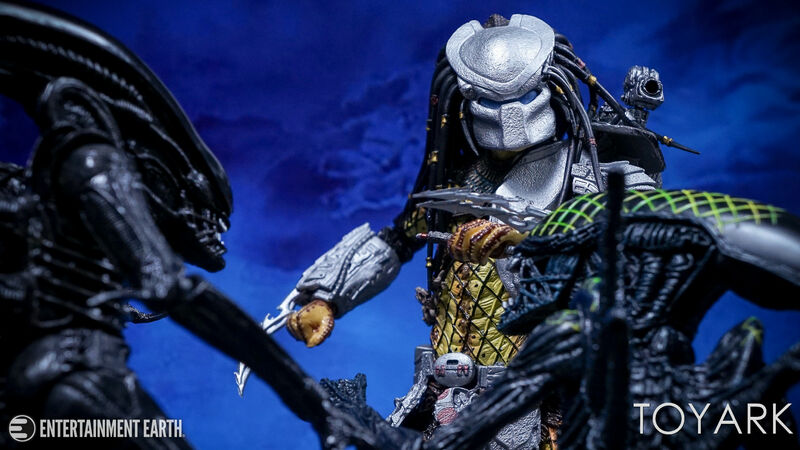 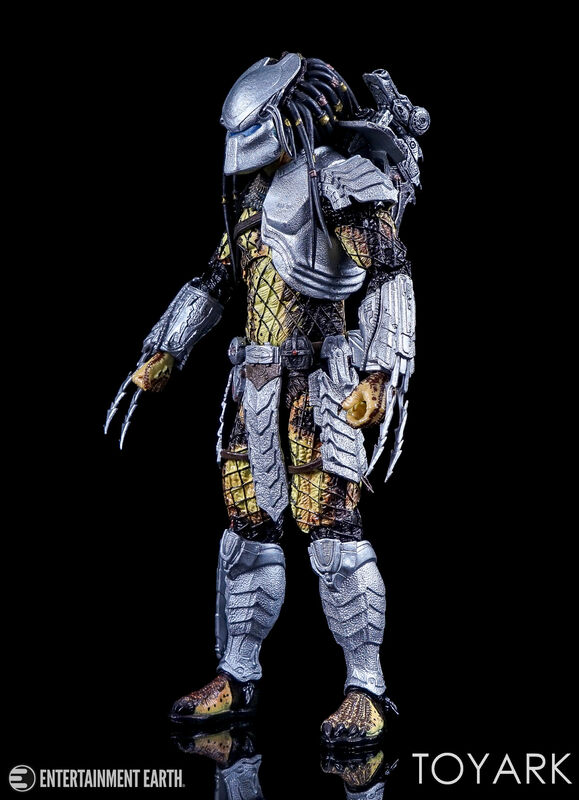 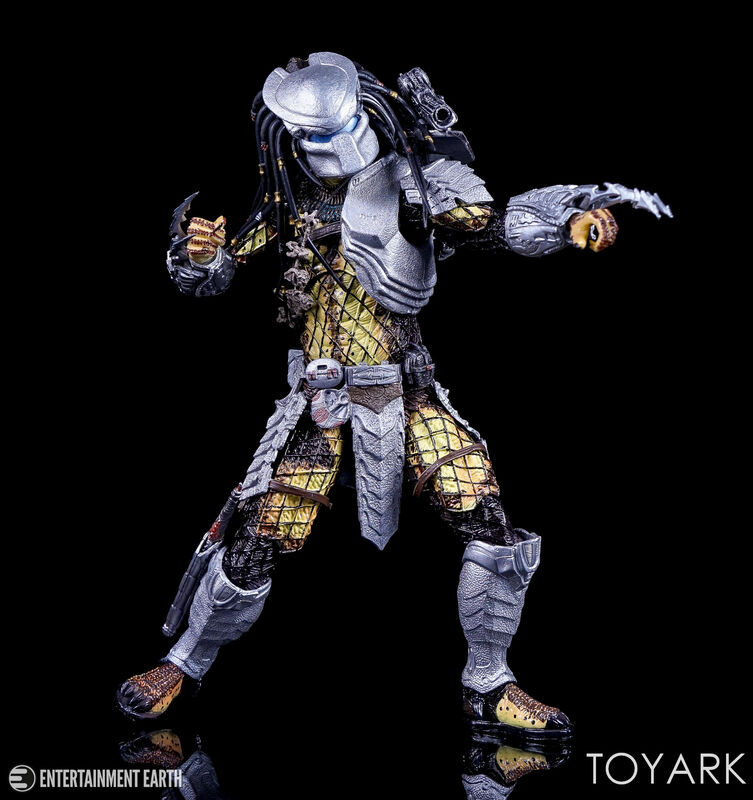 The figure has a lot in common with previously released AvP figures such as Scar Predator and the Ancient Warrior Predator. 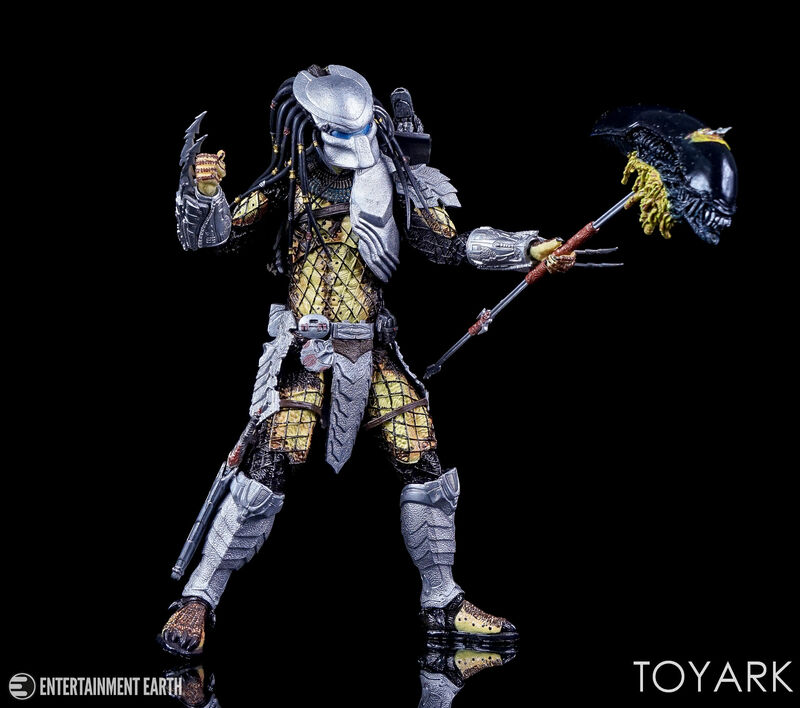 They use the same main body sculpt, with different armor pieces swapped out to make the figure more unique. 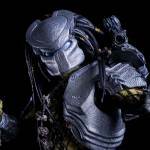 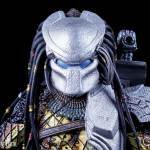 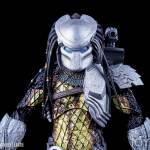 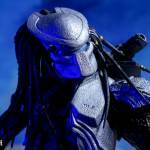 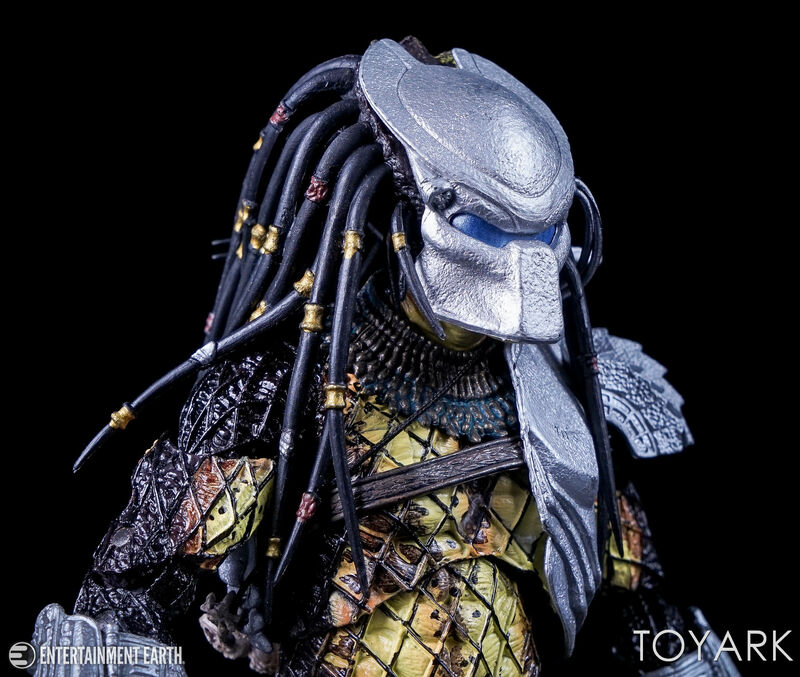 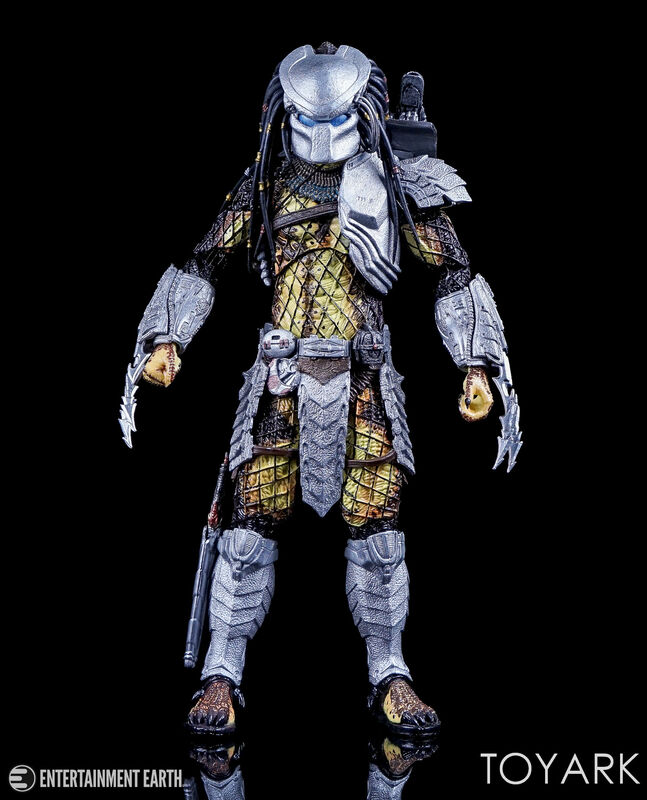 The mask is similar in style to the Scar Predator (sans scar). As with those releases, the sculpted details here is excellent. 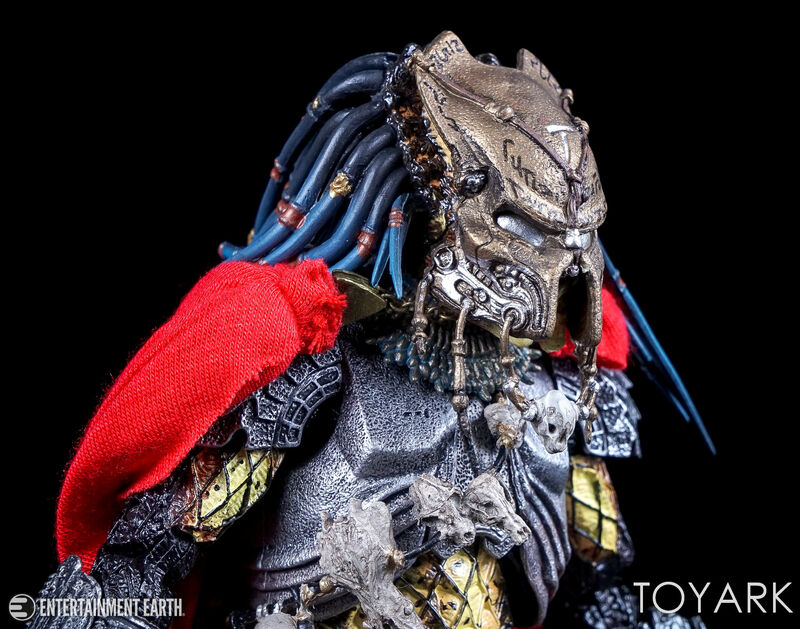 The highly textured sculpt work on the mask and armor pieces is quite impressive. 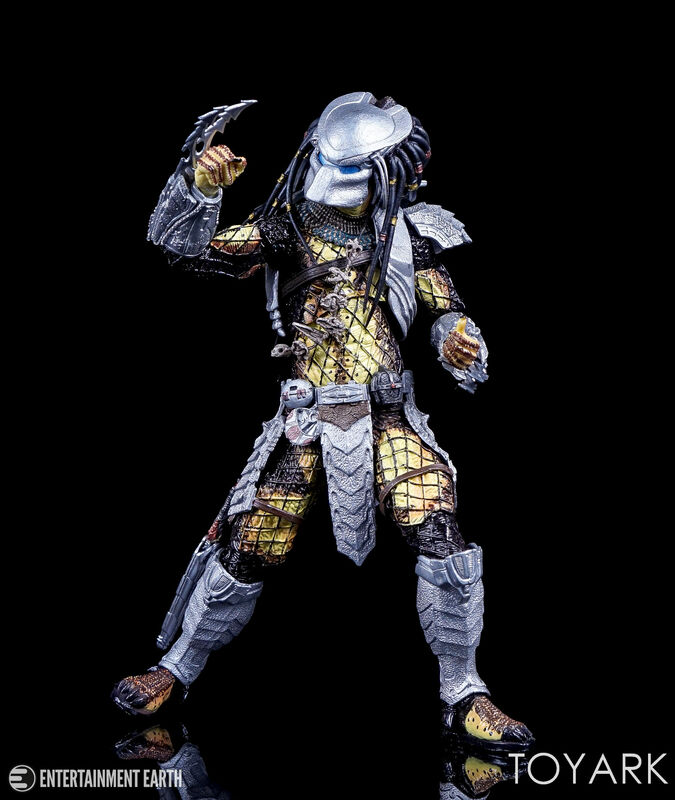 The body sculpt is nicely detailed as well, with lifelike skin texture and finely sculpted netting (which is painted here). 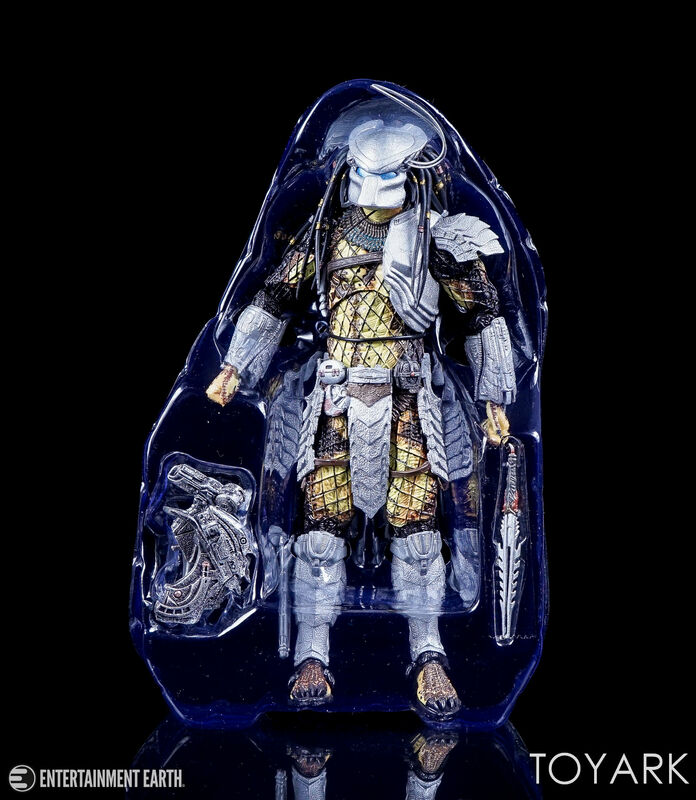 The paint work on the Youngblood features intricate detail work, wit hthe netting beign painted and nice transitions in the various body colors that make up a Yautja. 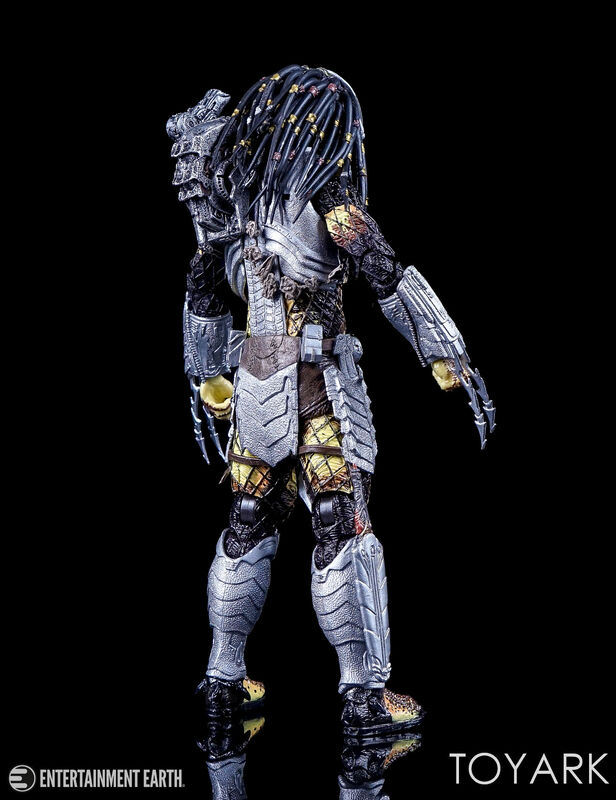 Blades are removable from the gauntlet and the Plasmacaster is removable from the shoulder. 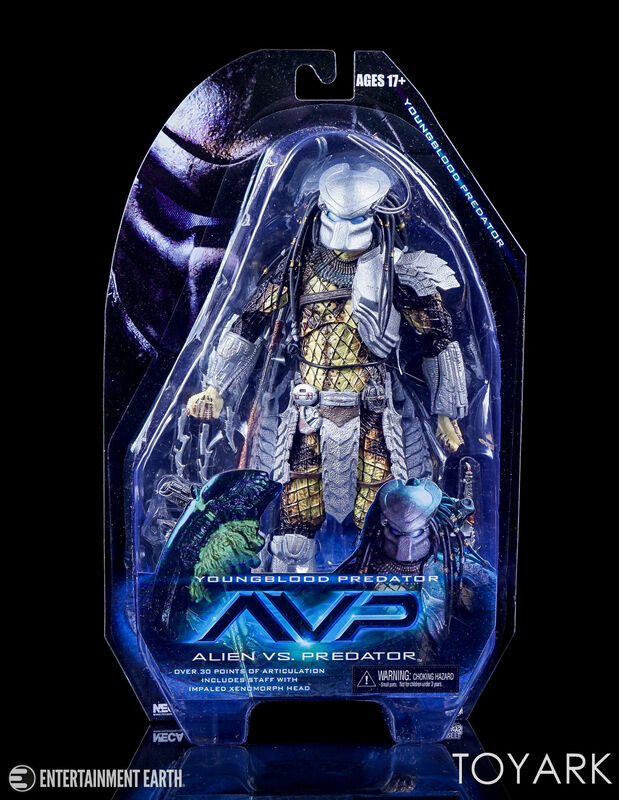 These can be used with the other AvP Predator releases. 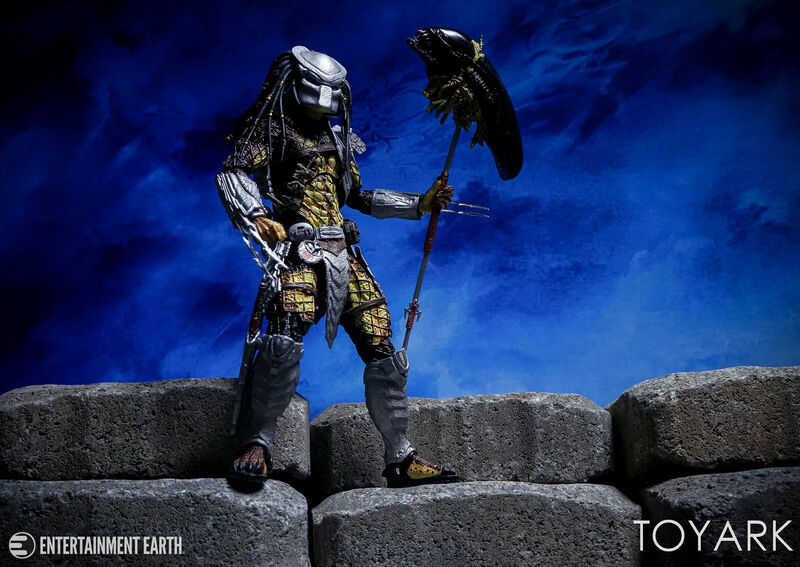 There are differing paint washes over the whole figure to add depth to the sculpt. 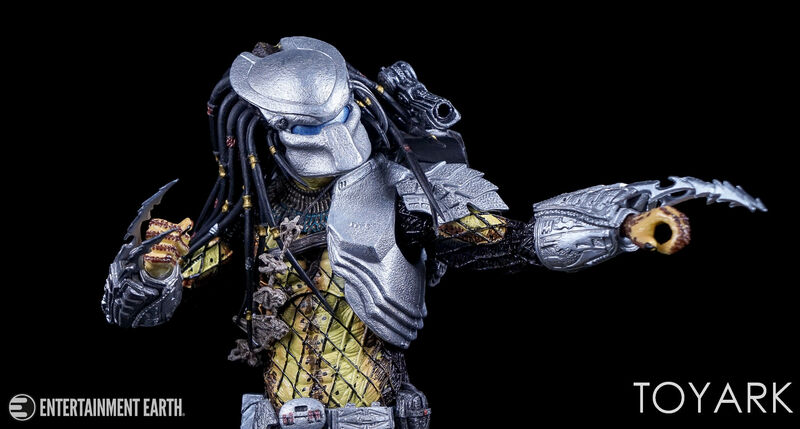 The wash over the armor is much more sparse, giving it a cleaner look, while the body has a more opaque paint wash that works to give it a more natural look. 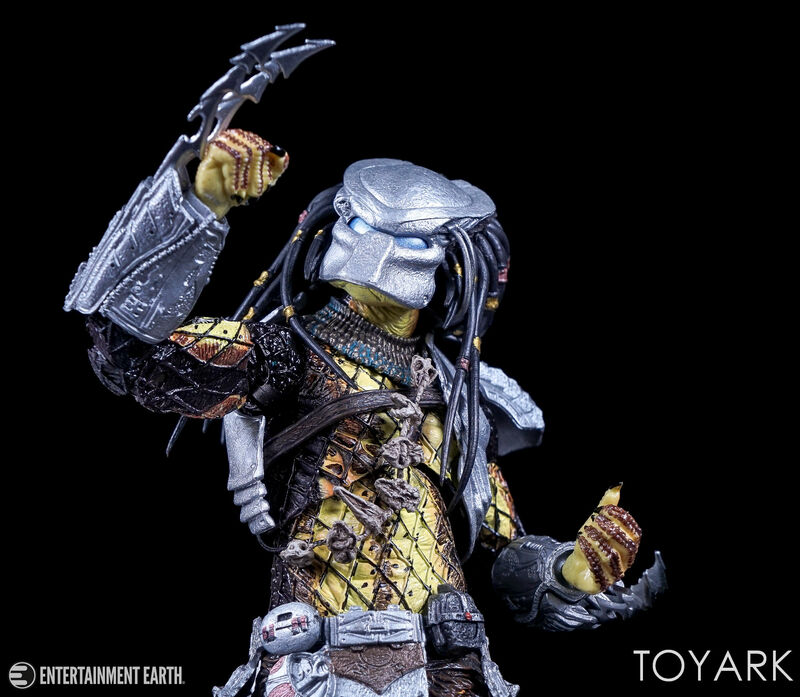 There are over 30 points of articulation on the figure. 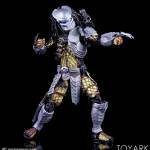 These include the great double jointed elbows and knees. 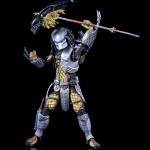 The armor is handled in a way that doesn’t hinder the range of motion. 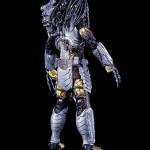 Removable parts such as the wrists, blades and plasmacaster all come off and reattach without any trouble. 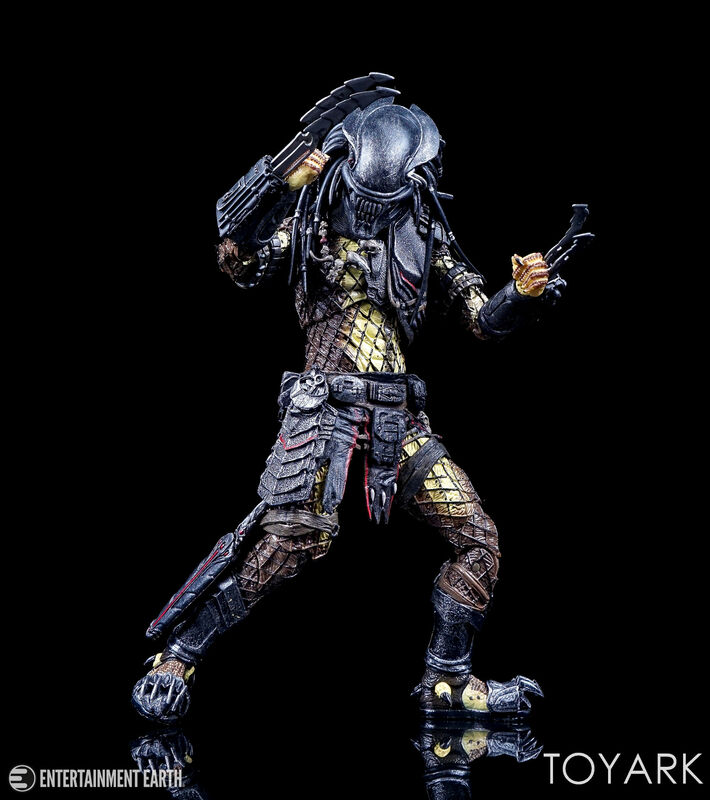 Joints are very tight here, giving the figure a sturdiness that allows him to be posed in dynamic positions without the need for a stand. 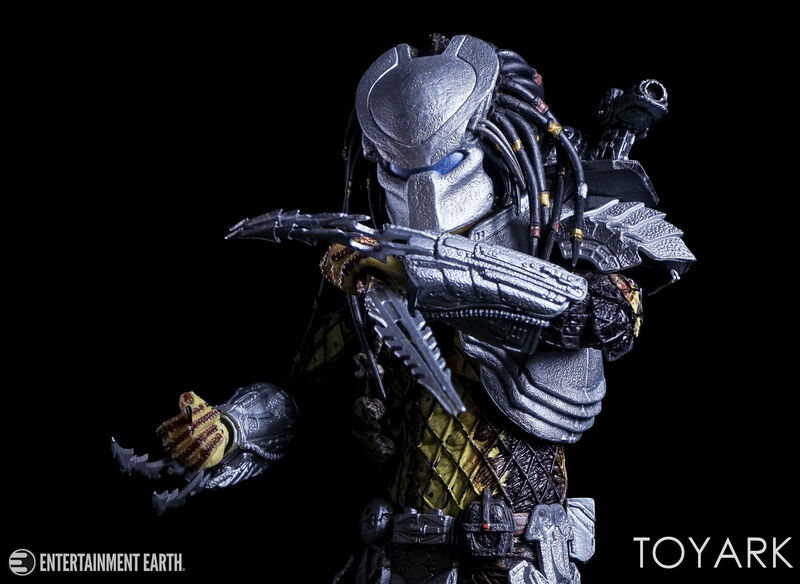 My only problem with the figure is that the wrists are small ball joints. 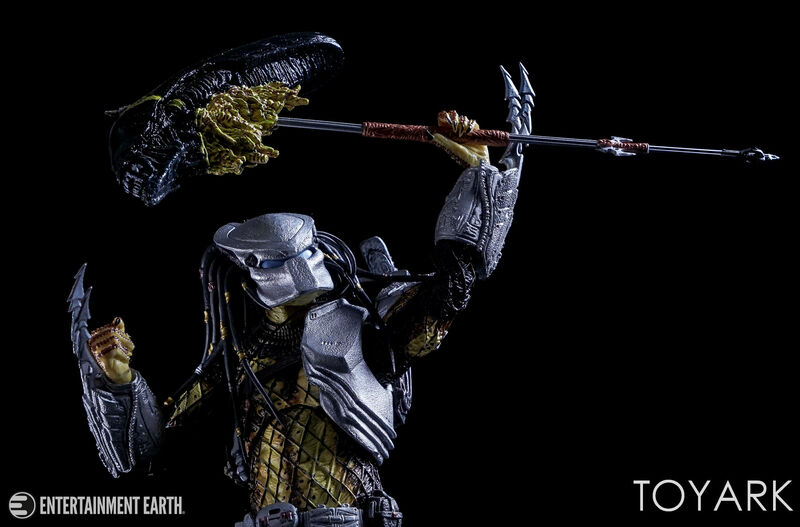 The impaled Alien head is quite heavy and the wrist joint just can’t support it in position for more than a few seconds. 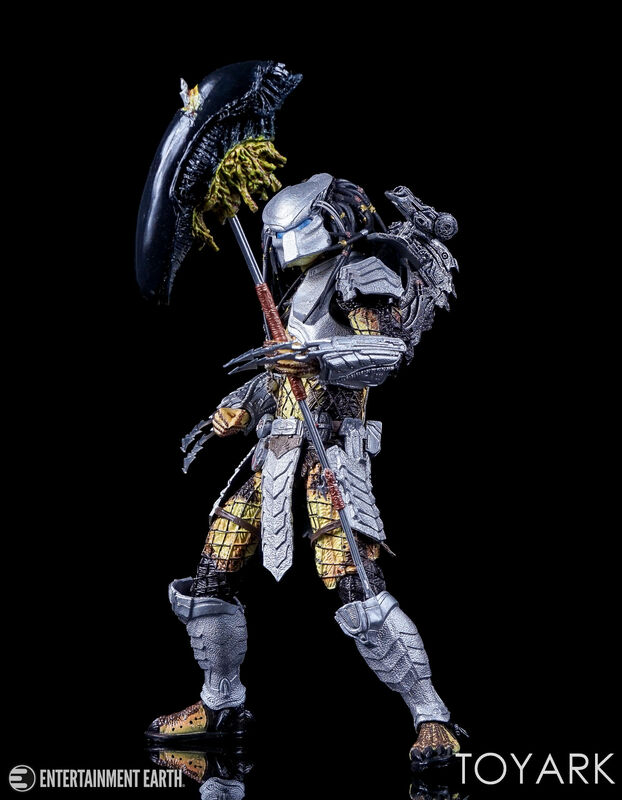 Other than that, this is another top notch addition to the AvP line up. 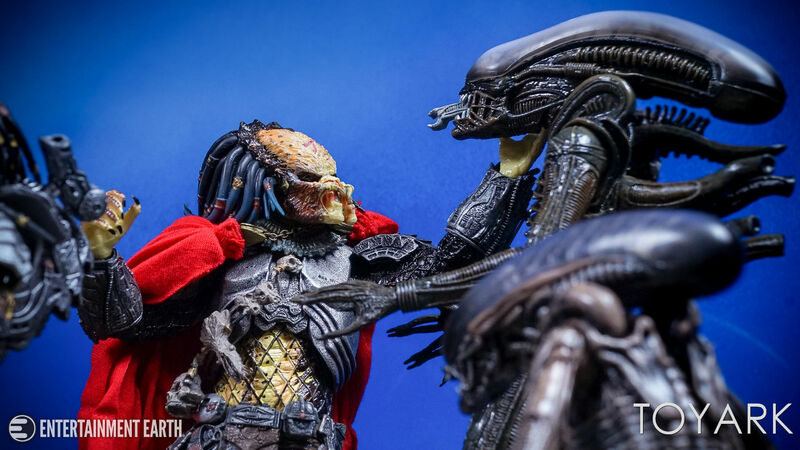 Check out some highlight photos below and the full gallery after that.